If you’re looking for family-friendly fun this autumn holiday, make sure you stop by Redwings Mountains for a series of activity weekends celebrating everything we love about horses and donkeys, beginning on Friday 28th September. Our Scottish visitor centre, near Forfar in Angus, will be hosting “We Love Horses” and “We Love Donkeys” themed activities where you’ll have the chance to join in with an array of exciting activities, including fascinating talks and pony grooming sessions. Plus, entry is free! You’ll also get the chance to enjoy cuddles with Adoption Stars, handsome cob Gibson who was raised at the Sanctuary from a foal, and delightful donkey Minnie and her son Mouse. 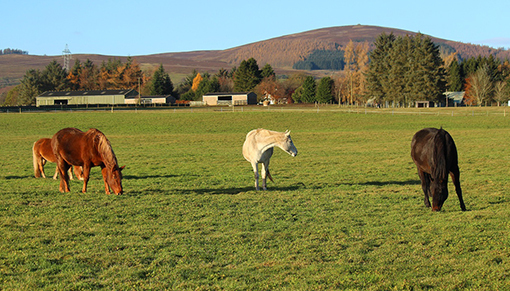 Redwings Mountains is set in 220 acres of beautiful paddocks and woodland providing a place of sanctuary for over 90 horses, ponies, donkeys and mules as well wildlife including red squirrels and mountain birds. Once you’ve made lots of new four-legged friends, why not stop by our Nosebag Café where you can treat yourself to a tasty refreshment? Our gift shop also offers a wide range of souvenirs you can purchase and treasure as a reminder of your day. All proceeds go towards supporting the hundreds of horses, ponies, donkeys and mules in our care nationwide. Redwings Mountains (DD8 3SQ) is open every Friday, Saturday, Sunday and Monday, 10am to 4pm (closed Tuesdays, Wednesdays and Thursdays). Entry is free and dogs on leads are welcome.